The vast majority of the information presented in this blog describes head injury and concussion’s impact on visual function. Traumatic brain injury (TBI) can disturb eyesight independent of damage to the eyeball. The close connection between the eye and brain has been highlighted. However, there are instances where the eyeball itself can be injured directly. Blunt or sharp trauma to the face can directly damage the eye. The eyelids are frequently swollen shut after facial trauma. The lids have very thin skin and are vulnerable to bruising. Anybody who has ever seen a boxing match has seen a boxer’s eyelid close after being struck close to the eye. Unfortunately, if this happens in the emergency room after an automobile accident, the eyes can get overlooked. Emergency room doctors are often reluctant to pry the lids apart to inspect the eyeball. The worst injury that can be missed is called a “ruptured globe.” The eyeball is covered by a durable shell (the cornea and sclera) but these tissues can be penetrated with sufficient force. If the wall of the eye cracks, the fragile contents of the interior of the eye can be scrambled. These tissues are extremely sensitive to any element of disruption, and a ruptured globe can commonly cause blindness. The ruptured globe must immediately be recognized and an ophthalmologist called in to the hospital on an emergency basis. Ruptured globes are usually operated on within 12 to 24 hours after trauma in an attempt to restore the structural integrity of the eyeball. This is a true eye emergency. Sometimes ruptured globes are recognized on CT scans of the head and face being done for other reasons. Again, if the eyelids are swollen, an underlying globe rupture can remain hidden. The prognosis of ruptured globes depends heavily upon the size and severity of rupture. 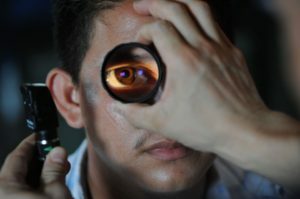 A small laceration to the cornea (the front of the eye) can often be fixed easily by an ophthalmic surgeon and the probability of vision recovery is high. Larger lacerations or ruptures of the more posterior sclera (the white hard coating of the eye) often cause damage to the retina and carry a much poorer prognosis. The initial surgical effort is to restore the integrity of the globe and prevent leakage of internal ocular tissues outside the eyeball. Future surgeries are often required to remove blood, fix the retina, and remove damaged lenses (traumatic cataracts). These efforts are frequently unsuccessful and the eye must sometimes be removed entirely (enucleation). Permanent vision loss is a severe complication of head and facial trauma. Prompt treatment of the ruptured globe is important. I’ve served on a ophthalmology trauma panel for over 30 years and have treated many ruptured globes. In head injury patients, head trauma and eye trauma can occur together and both require expert medical care.